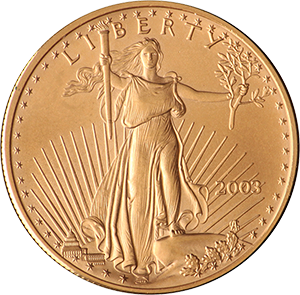 The American Eagle gold coin was first released as official U.S. bullion in 1986 and has since become a mainstay of the most trusted and ubiquitous gold bullion in the world. The value of the 1oz American Eagle is usually slightly above the market value of the gold content, meaning it makes for a reliable investment in both the long and short term. American Eagle gold coins actually refer to two different types and have been regularly confused. Firstly, the gold bullion that was first minted in 1986, with its high collectability, and also the Golden Eagle, which refers to the pre-1933 10-dollar gold coin. For this reason, the newer gold bullion releases are typically referred to with the weight of the coin prefixed, such as the 1oz American Eagle gold coin. American Eagle gold coins range from 1oz to 1/10oz (with 1/2oz and 1/4oz also available). This makes the 1oz coin the largest and most valuable of the set. It has a diameter of 32.7mm and thickness of 2.87mm. The gross weight is 1.0909oz and it has a face value of $50. One of the major selling points of the American Eagle gold coin is its purity, 24 carats, making it amongst the very purest on the global market. The 1oz American Eagle is the most ubiquitous of all weights, with well over a million released in 1986 to great fanfare, although occasionally, the smaller 1/10oz coin has outnumbered its mintage. 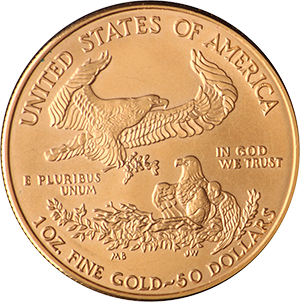 The design of all American Eagle gold coins are identical, with the obvious exception of the coin’s weight and face value. For the first few years of it’s existence, the American Eagle used Roman numerals to signify the date of release, this changed to Arabic numbers in 1992, which are still used to this day.